I said I was afraid of the Dodgers in a 5 game series and this was why. You lose game 1 at home in a 7 game series and you're upset, but not despondent. You lose game 1 anywhere in a 5 game series and you're hosed. Now we just have to hope and pray Zambrano doesn't explode tomorrow in game 2. Now I'm not one to put too much stock in curses and what not, but when your pitcher who's been unbeatable at Wrigley Field all year, with 2 outs, walks the bases loaded and gives up a grand slam, you have to wonder. There's a lot of luck in this game. Can't it go our way just once? 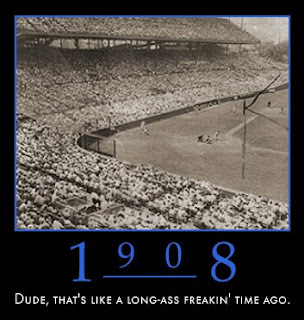 100 years is a long streak of bum luck. But teams that win World Series overcome these kind of things. It's easy to think "this is over", but if millions of Cubs fans think that, it's hard for the team to overcome that negative energy. Stay positive people. The Padres lost game 1 of the 1984 NLCS (which was a 5 game series at the time) 13-0, and went on to beat the Cubs. The 2001 Diamonbacks lost 2 heartbreaking extra-inning games to the Yankees and were losing in the bottom of the 9th of game 7 against Mariano Rivera and won. The 2004 Red Sox were down 3 games to none against the Yankees in the ALCS and went on to win it all. And it's about time it happened for us.